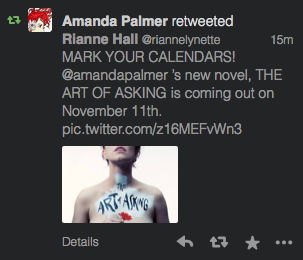 On November 11th of 2014, Amanda Palmer’s new novel The Art of Asking is coming out. It is not available on Amazon, but you can preorder it here. She will also be doing a book tour. If you haven’t heard of Amanda Palmer before, you have been missing out on one helluva-woman. She has worked hard to become a great musician, as well as succeed in the music industry without losing her soul. This book has been a long time coming since her Ted Talk on discovering how to move through the music industry by accepting help from her fans. Trusting her supporters and creating a lasting relationship with them on stage changed the way she produced music, and the way she moved through life in general. A few of my favorite songs of Amanda’s include “Missed Me”, “The Killing Type”, and “Girl Anachronism”. Not to mention “The Bed Song” and “Do You Swear to Tell the Truth The Whole Truth and Nothing but the Truth”. Just all of it. Go listen to all of it. She’s got a unique sound, a big heart, and a world perspective that leaks into all of her music. I freaked out when I saw this. She goes out of her way to try to connect with her fans, including being extremely active on Twitter. Apparently, she wasn’t always that way according to this blog she wrote on hitting a million followers. She often does random Ask Amanda sessions and announces spontaneous concert times and venues. Even throughout her book-writing journey, she asked her supporters for help when she was stuck. But what I like most about Amanda is she is unapologetically and tragically real. I have never met Amanda before, or even been to one of her concerts (despite various efforts), but through her music and her social media presence, I have fallen in love with her. And she doesn’t know me, and she may never know me, but she cares about me. It’s an unspoken understanding she has with, I would venture to guess, all her fans. And so, I support her in whatever ways I can. And today that means spreading the word about her new novel coming out. Watch the Ted Talk, and if you like it, buy the book. Support her if her like what she does, and practice literary citizenship. Because if we aren’t there for each other, who will be?